You and I are God’s beautiful creations: “So God created mankind in his own image, in the image of God he created them; male and female he created them”, Genesis 1:27, with no blemishes and free of sin, yet because the first man and woman did not obey God’s given commands, they fell into sin that caused a completely new movement in the universe. Remember, how God created man? Out of dust, yes, you and I were nothing but, dust! No one likes dust on their shoes, clothes…in fact some may even be allergic to dust. God was not allergic to it, nor did He get rid of it. Why? He had a better plan, a bigger picture! All of that changed when God created man out of that dust and breathed life into him…“Then the Lord God formed a man from the dust of the ground and breathed into his nostrils the breath of life, and the man became a living being”, Genesis 2:7. God created something as beautiful as you and me out of nothing, but a handful of dust, “to bestow on them a crown of beauty instead of ashes, the oil of joy instead of mourning, and a garment of praise instead of a spirit of despair”, Isaiah 61:3 …”With man this is impossible, but with God all things are possible”, Matthew 19:26… WOW, now I can’t resist not singing the chorus to this song: “You make beautiful things out of the dust,/ You make beautiful things,/ You make beautiful things out of us all around,/ You make me new,/ You are making me new”. So many times we sing and praise His name with our hands lifted high when things are going great in our lives, but wow, when things start going bad and feeling that no one cares; feeling like literally being down in the valley that is when our faith is put to the test. The question is: How do you and I pass this test? Do we go complaining and murmuring, as the people of Israel did in the desert? Or do we choose to try and enjoy the journey thanking God even though it hurts really badly? When I surrender to God’s ways, He has a plan for prosperity; a plan that honors Him. So why is it that instead of obeying and surrender, we tend to go the opposite way as if God’s plans would somehow destroy us? “For I know the plans I have for you,” declares the Lord, “plans to prosper you and not to harm you, plans to give you hope and a future. Then you will call on me and come and pray to me, and I will listen to you. You will seek me and find me when you seek me with all your heart,” Jeremiah 29:11-13. The thing that destroys us is listening to evil whispers. Don’t be fooled, evil will always be evil no matter how sweet and innocent it may present itself; but if you and I surrender to God’s ways and plans, all good things will come to pass. * God transforms – word of God has the power to transform every heart and life. “When you received the word of God, which you heard from us, you accepted it not as a human word, but as it actually is, the word of God, which is indeed at work in you who believe”, 1Thessalonians 2:13 and “For the word of God is alive and active”, Hebrews 4:12. * God says: everything is possible with Me! – no matter how low a person may have fallen, the Maker’s hands reaches even in the lowest pit for the muddiest clay, but in His hands that clay becomes something beautiful again. The Maker’s art shop is where creating and molding the clay making each vessel beautiful and unique…“How the precious children of Zion, once worth their weight in gold, are now considered as pots of clay, the work of a potter’s hands!”, Lamentations 4:2. * God shows his glory – using the broken vessels (you and me), therefore bring every broken piece to Him; he will make more than we can ever imagine. 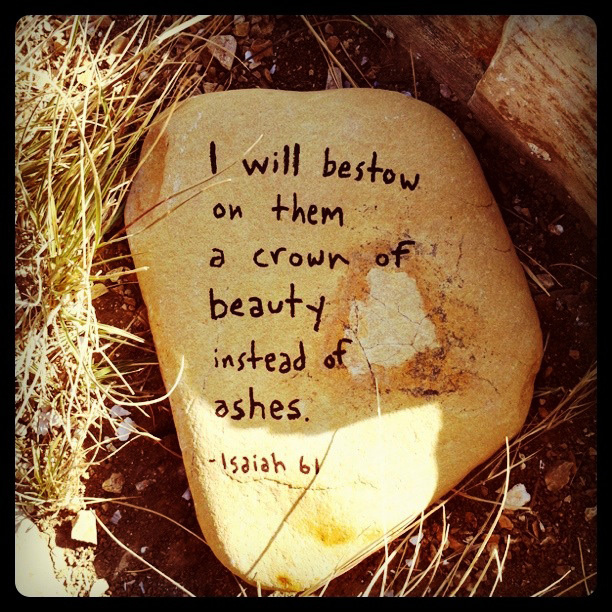 God uses the broken things to make beautiful vessels. God makes vessels of honor out of us… “I am the true vine, and my Father is the gardener. He cuts off every branch in Me that bears no fruit, while every branch that does bear fruit He prunes so that it will be even more fruitful”, John 15:1-2. * God heals – Jesus longs to heal, mend and replace those shattered broken pieces of our lives and reshape them into the beautiful women and men He has intended us to be, “You turned my wailing into dancing; you removed my sackcloth and clothed me with joy”, Psalms 30:11. * God used the broken heart of David (Psalm 51) – a sinful man, acknowledging his weaknesses, crying out to God in repentance, having a broken heart over his sin… redemption…”a broken and a contrite heart”. * God used a broken alabaster jar (Mark 14) – a sinful woman, but kneeling at the feet of Jesus seeking forgiveness for her sins…redemption…”a broken and a contrite heart”. * God used the broken body of Jesus (Matthew 26) to wash all our sins and through His grace granting us salvation and eternal life…”For God so loved he world that he gave His one and only Son, that whoever believes in him shall not perish but have eternal life”. Thinking of this reminded me of a documentary I saw on how to make a glass. A glass is clear and crystal and it shines beautifully, especially when freshly washed. Nevertheless, before that glass can shine, that glass material goes through a burning fire melting it down to being just liquid. The liquid poured into a glass shape that continues to be molded until the desired glass shape is achieved, leaving out any excess liquid to fall off; and only then, the glass is cooled off and washed so that it can be clean and shiny. I believe, much in the same way, our lives are being put through God’s burning fire… a fire not to destroy us, but to mold, shape, purify and cleanse us, making something totally beautiful that shines out His love around us…“that the fire had not harmed their bodies”, Daniel 3:27. Lord, I know you have been shaping and molding me into the person I am today, I have felt the burning flames around me, and even though I’ve felt at the bottom of the pit, I know your hand has sustained me and your blood has cleansed me. Now I am left to shine, “He who began a good work in you will carry it on to completion until the day of Christ Jesus”, Philippians 1:6. I pray that no matter how broken you and I may be in life, always have the courage to acknowledge and believe that God can forgive, restore, redeem and repurpose our lives. “He heals the brokenhearted and binds up their wounds”…“as far as the east is from the west, so far has removed our transgressions from us”…“Blessed is the one whose transgressions are forgiven, whose sins are covered”…“Be reconciled to God”, 2 Corinthians 5:20. Thank you Lord for restoring, redeeming, repurposing and using our broken hearts and lives to accomplish your purposes within each of us, for as our beauty shines through in all we do for your glory! This entry was posted in Articole -Camelia E. Micu and tagged Beauty for Ashes. Bookmark the permalink.